The Eye-Fi Mobile X2 does everything the previous Eye-Fi(s) did—upload photos to your computer and online—over a Wi-Fi network. The Mobile X2 has a new trick: It'll zap photos to and from your Android and iOS devices. Stupid easy setup. If you don't have a router, the X2's Direct Mode turns itself into a wireless hotspot, for a direct connect to your iOS or Android thing. Then you can flag photos for automatic upload to your computer via the Eye-Fi app when you get re-connected to the Wee-Fees. It'll offload videos, too, even ripping out the raw .mts file from ever-fickle AVCHD videos. 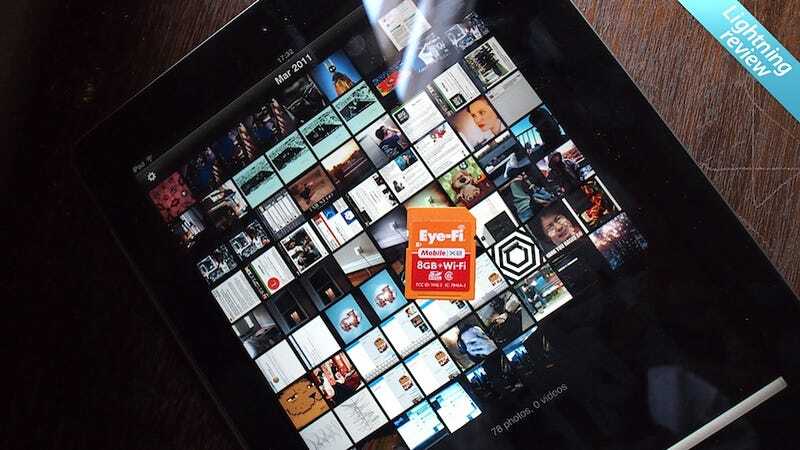 Bonus: The Eye-Fi app also beams photos from your phone's camera to your computer for you, sans wires. Transfers times from the card to your photo bucket of choice are not insignificant (around 10-20 seconds, and that's after the 5-10 second warm-up time for the app). Both the iPad app and the desktop app could afford to be less ugly and more user friendly. If you're someone who shoots a lot of photos on actual cameras and would like to have them automagically appear on your smartphone or computer, it's hard not to recommend the Mobile X2. But at $80, you might first want to consider just how much you'll really use (or even need) it. Services supported: Facebook, MobileMe, Picasa, YouTube, Flickr. Full List here. Compatible Cameras: 1000+. Full list here.